The compounding plant where Teknor Apex Company produces the Medalist range of medical elastomers is now certified under the international ISO-13485 standard for quality management in medical manufacturing, it was announced today by the Thermoplastic Elastomer Division. ISO-13485 specifies systems for consistent compliance with regulatory and customer requirements and includes provisions for risk management, sterile manufacturing, and traceability. 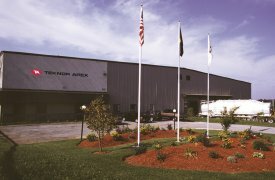 "The comprehensive implementation program required for ISO-13485 certification has focused our entire St. Albans operation on processes and procedures that maximize the safety and reliability of the compounds we supply to medical device manufacturers," said Paul Burke, business director for North America. Developed for device manufacturers, ISO-13485 is not an essential standard for a compounder, noted senior medical market manager Nick Sandland. "Medalist elastomers are already fully compliant with regulations for medical uses and meet stringent standards for biocompatibility and purity," Sandland said. "Teknor Apex undertook procedures for achieving ISO-13485 certification in order to provide our customers with an extra dimension of quality assurance and to demonstrate our commitment to the Medalist brand." The Medalist product range provides the broadest selection of high-purity elastomers available to medical manufacturers, according to Sandland. Medalist medical elastomers utilize multiple polymer chemistries and technologies to achieve desired functional properties. Shore A hardnesses range from 5 to 87. Clear, translucent, and opaque grades are available for injection and blow molding, multi-component molding, and extrusion of tubing, profiles, films, and coatings.